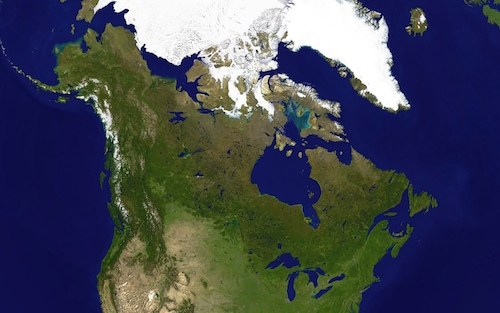 Satellite composite image of Canada. Historical events can exert impacts, not just on the course of events of their own day but their effects often ripple through subsequent historical eras, long after the events have been forgotten. So it is with the Franklin Expedition. Amidst the ripples are the ice jams, historical forces colliding like pressure ice floes in Arctic waters, generating further historical change. Both ripples and ice jams characterize the history of the Arctic during and after Franklin's last expedition of the 1840s. This section considers several potentially major historical impacts arising from Franklin's missing expedition: Cultures in Contact, Discovery of the Northwest Passage, Geomagnetism and the search for the North Magnetic Pole, Incorporation of the Arctic archipelago (Nunavut) into Canada, Climatic Change, and the search in the twentieth and twenty-first centuries. These major themes reflect historical problems which are still hotly debated. We invite you to solve these mysteries: what is the significance of these larger events? What are the long-term impacts of the Franklin Expedition?